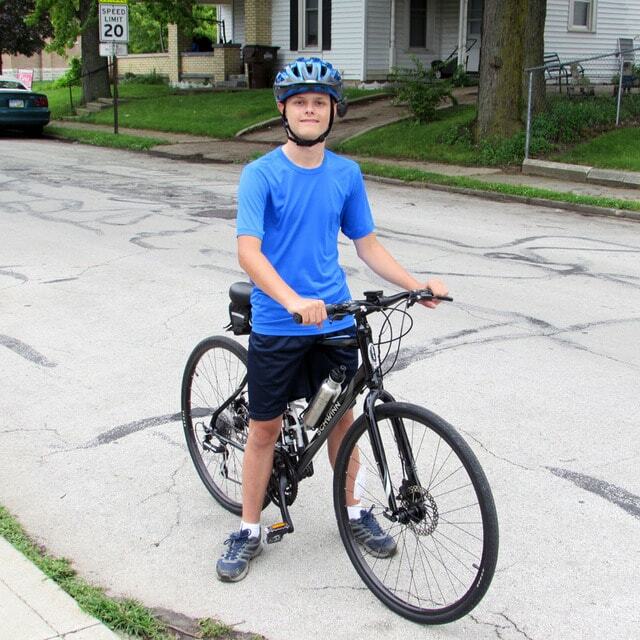 Ethan Callahan, 14, of Greenville says he “always” wears his helmet when riding his bicycle. Medical professionals say that wearing properly fitted protective head gear can prevent traumatic head injuries. DARKE COUNTY — Should children wear safety helmets when riding bicycles, skateboards or other recreational modes of transport? The issue has been brought to the forefront of discussion locally, coming on the heels of bicycle-riding children in the area who have been struck by vehicles. On June 10, a 10-year-old boy from Union City died from his injuries after being struck by an SUV. Weeks later, on June 22, a 12-year-old Bradford boy died after riding his bike into the path of a truck. Earlier, on May 13, a five-year-old boy near Bradford was struck by a UPS delivery truck after entering the roadway from a private driveway. He survived his injuries. In each incident report, officers noted that none of the children were wearing protective head gear. Sam Iden, medical director for the Emergency Department at Reid Hospital in Richmond, Indiana, said that the hospital typically encounters an increase in child injuries during the summer months, when youngsters are spending more time outdoors. As for why children seemingly suffer more head-related injuries than adults, Iden pointed to physiological differences between the two. In May, Ohio Senator Shannon Jones, introduced Ohio Senate Bill 157, which would require children under the age of 16 to wear a properly fitted safety helmet while on a bicycle. Though the bill currently sits in committee, a staffer for Sen. Jones told the Daily Advocate that the senator hopes her legislation will receive fresh consideration in August or September. According to a fact sheet provided by the Ohio Department of Health, Violence and Injury Prevention Program, traumatic brain injuries (TBI’s) suffered by Ohio children riding bicycles and other non-motorized, wheeled recreational vehicles increased 110 percent from 2002 to 2010. The majority of the head injuries were incurred by children riding pedal-driven cycles. The National Highway Traffic Safety Administration (NHTSA) says that nationwide in 2013, there were 743 pedalcyclists killed and an estimated 48,000 injured in motor vehicle traffic crashes. Ohio accounted for 19 of the fatalities that year. Chief Deputy Mark Whittaker of the Darke County Sheriff’s Office agrees. “It is our recommendation that anyone riding a bicycle, skateboard or anything like that faces a potential risk of falling and should wear a helmet,” he said. Whittaker noted that while the safety of children on the county’s rural roads remains a strong concern for the deputies, the agency does not currently have a bicycle safety program in place. While the recent incidents of bike-riding children being struck by vehicles makes headlines, Whittaker said it is not the norm. “A kid is more likely to fall off a bike than being hit by a car,” he said. One local organization, among many others, is seeking to reduce the likelihood of children suffering TBI’s when bike riding. On August 3, the Darke County YMCA will be conducting a Bike Safety Awareness day, titled “Stay Safe, Ride Smart.” The event, free to the public, will be held at the YMCA parking lot in Greenville from 5:30 to 7:30 p.m. Youngsters will be invited to have their bicycles safety checked, with mechanics on hand to make minor adjustments as needed. Helmets will also be examined for a proper fit. Those without a helmet will be given a free one courtesy of Rocketship Sports Management. Iden remarked that when it comes to TBI’s, it is unfortunate that people are often influenced by popular media instead of the strong data available.